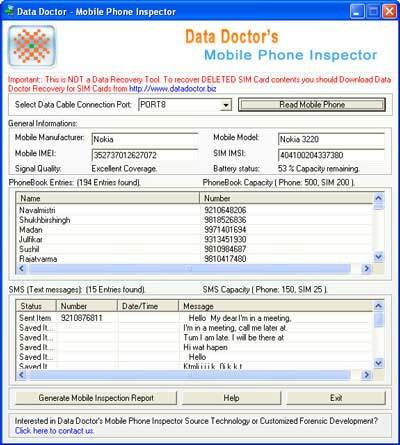 Cell phone inspector software easily fetches or display all detailed information of your mobile phone and sim card including sms memory status, sim imsi number, phonebook contact number, mobile model number, battery status, signal quality, manufacturer name and imei number of windows based mobile phones. Mobile phone investigation tool easily runs on all microsoft windows operating system including windows vista, xp, nt, me, 2000, 2003, 98 etc. 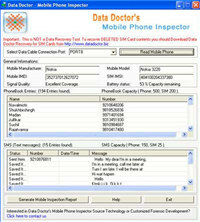 Mobile phone examination application supports all your symbian os based nokia mobile phones and other supported phones. Scientific investigation utility is helpful application for fetching valuable information about your mobile phone. Mobile phone analysis software supports all pocket pc mobile phone including hitachi pocket pc phone, motorola i930, sony ericsson, anex tek sp230, nokia n-series, nokia e-series, samsung blackjack etc. Cell phone inspector utility does require any special technical knowledge to use this software and provides interactive user friendly graphical user interface (gui). Windows mobile analyzer tool easy gather all information from windows based mobile phone. Cell Phone Inspector Software is an utility that works under windows xp, windows vista, . Estimated download time for Cell Phone Inspector Software on a common adsl connection is less than a minute. Version 2.0.1.5 was released four thousand one hundred sixteen days ago by Data Retrieval Software. Click the green download button to download it now.